Frank Frazetta’s Thunda Tales #1, published by Fantagraphics Books, Inc., 32 pages, original price $2.00. 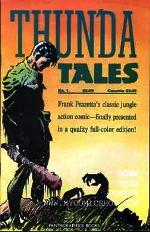 In 1987, Fantagraphics Books published a reprint of a comic called Frank Frazetta’s Thunda Tales. Originally released in 1952, simply as “Thunda Tales,” this four-color yarn of a World War II aviator turned jungle lord is said by some to be the only comic ever printed containing solely the work of artist Frank Frazetta. True or not, the aspect of Frazetta’s energetic, powerful and, appropriately enough, primal, art work from front cover to back is enough to attract comics enthusiasts and art fans alike. Thun'da Tales is pure escapist enjoyment. Despite the need for total suspension of disbelief at an adult man’s memory of the modern world and it’s ways becoming far too hazy, (in order to allow his language to be written as that of another popular strip’s jungle king at the time, I’d imagine), the story does manage to engage readers with it’s action, characterization and sense of story progression. Gardner Fox, already a prolific creator of many D.C. Comics characters, took a hand in writing Thunda’s adventures. Though the main character and his origin were not complex, Fox managed to entertain with straight-forward action and adventure, and instill Thunda with an endearing roguish quality. His jungle man had an indomitable will, driven by what seemed an always-quick and seething temper, but still managed to remain a sympathetic character. Recommended to those whose interests are superior art and comics history, Thunda Tales #1 is a great read for fans of high action and adventure, as well. Find it at comics shops, and online retailers and auctions. Prices vary greatly, so shop around.